Kubota MX5200 – Take on the tough jobs in a tractor you’ll be proud to own – Kubota’s new MX5200, featuring a powerful and clean 54.7 HP Kubota diesel engine (Tier 4 Final). It’s built to get things done. The new MX Series features several upgrades, including environmentally-friendly performance with Tier 4 Final emissions, increased engine power, greater seat comfort, and more ergonomic factors, including electric over hydraulic PTO engagement. 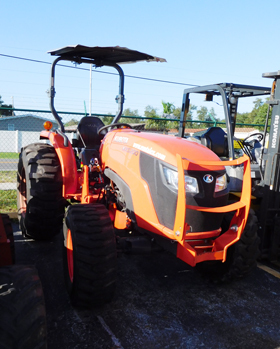 The new MX Series is everything you want in a utility tractor, and more. 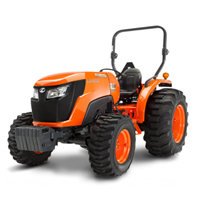 More Powerful and Clean Engine – Kubota takes tractor performance to the next level. HST Transmission – Kubota’s new MX5200 model features hydraulic servo HST systems that increase pedal responsiveness, and ease on pedal-shifting for smooth performance and improved control, regardless of load size. Gear Drive Transmission with Synchro Shuttle Shift – Kubota’s Synchro Shuttle Transmission lets you spring into action with smooth control and power. Bevel Gear Front Axle – A superior feature that delivers an extremely tight turning radius with full power transfer to the wheels at every steering angle. High-back Suspension Seat – Work has never been this comfortable. The new suspension seat with a high seatback offers greater comfort and minimal back fatigue even after a long day’s work. The luxurious design is also pleasing to the eye. New Dash Panel – The newly designed dash panel with larger and easy-to-read gauges and digital LCD panel with parking indicator provide all the vital information you need for your MX tractor, including ECU and fault code management. Operator Comfort – Kick back, relax, and get working. The full-flat deck enables safe and easy mounting/dismounting, and the 30 spacious inches between fenders gives you all the room you need to work in comfort. Easy Handling and Maneuverability – Both 2-wheel drive and 4-wheel drive models come equipped with a smooth, easy-turn, hydrostatic power steering. Engine Throttle – The handy engine throttle is conveniently positioned next to the steering wheel. Throttle up easily when you need that extra power to get out of tight situations or when hauling that extra load. Total Displacement: 148.6 cu. in. Fuel Tank Capacity: 13.5 US gal. PTO Type: Live independent, hydraulic PTO with PTO brake, wet clutch.